Did these set of fashion nails for Joanne and Liying! I’ve been seeing soooooo many manicurists doing these designs and finally I had to chance to try it out too! Liying showed me this super popular peter-pan collar design and wanted me to replicate it for her. Love how the white with gold glitter matches the black nails, I especially love the gold glitter, it looks super glam in real! Design done with Angel Pro gelly & white gel. 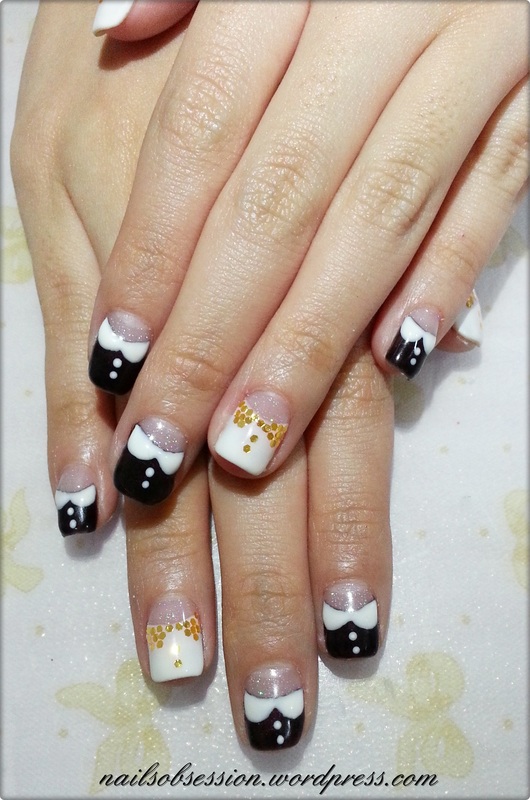 After seeing Liying’s design, Joanne wanted something similar too but she wants to use my Japan ribbon sticker so I suggest tuxedo nails with sticker bow tie! Changed the base from white to glitter so that the growth wouldn’t be too obvious. Added in the peter pan collar for her bcos’ so that it wouldn’t look so boring with all the tuxedos!